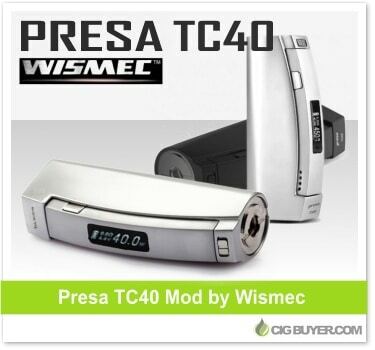 Like the original Presa 40W Mod, the Wismec Presa TC40W Mod offers up to 40W of output power with the added benefits of temperature control. It looks exactly like the original with its sleek, modern appearance; and it’s ergonomically designed to fit within the palm of your hand. It includes a high capacity 2300mAh battery, will fire down to 0.05 ohms and has a unique firing button that runs almost the entire length of the device. Use it with standard kanthal coils, or choose Titanium (Ti) and Nickel (Ni200) coils as well.